Last month, I toured Washington D.C.’s Edward C. Mazique Parent Child Center, one of 1,600 low-income preschool providers funded by the federal Head Start program. At lunchtime, well-behaved four- and five-year-olds dutifully served each other apples, cucumbers, and noodle soup. Elsewhere, a more mischievous group rolled on the floor while a teacher patiently tried to read aloud. Everything I saw suggested happy students, clean classrooms, and engaged teachers. Indeed, Mazique has become something of a poster child for Head Start. In 2010, Cabinet members Tom Vilsack and Kathleen Sebelius visited it to celebrate the one-year anniversary of a new children’s health insurance initiative; in 2007, when Congress passed its latest authorization of Head Start, then–House Speaker Nancy Pelosi let a four-year-old Mazique student born with a hearing-loss disorder sign the bill. But now Mazique is in danger of losing its funding, due to a new Obama administration policy that requires Head Start providers deemed “deficient” to compete for funding that was previously guaranteed. This is big news in education circles: While No Child Left Behind’s K-12 mandates are being phased out, national standards are coming to early childhood learning. Unfortunately, if the Mazique example is any indication, the plan’s blunt approach is jeopardizing perfectly good Head Start providers. UNTIL NOW, once a Head Start grant had been awarded to a preschool program, it hung onto it more or less indefinitely, barring a grave violation. The new plan to allocate funds competitively—which was first announced in November and is known as “re-competition”—would eliminate Head Start’s guaranteed funding structure. Starting this year, providers that fail to meet certain thresholds in any one of seven criteria (such as student health, teacher quality, or proper use of funds) must re-apply for their grants against non-Head Start–funded preschool programs. Winners will receive grants for at least five years; losers will likely be forced to shut down. (132 programs were deemed “deficient” this year; results of the competition will likely be announced in the fall.) While the plan is in keeping with President Obama’s education reform efforts, which stress competition over mandates, it also represents a major, high-stakes departure. Rather than just give out new grants, a la Race to the Top (Obama’s signature education reform competition), it will deny and reallocate existing ones. What’s surprising is that the re-competition, which will inevitably result in lost jobs, displaced students, and disrupted neighborhoods, has garnered very little criticism from early education advocates. This is partly because President Obama—someone generally understood to be a proponent of Head Start—is the one proposing it. As Brookings scholar and former Bush administration adviser Ron Haskins suggested to me, if the plan were put forward today by a Republican president, it would be interpreted as a sneak attack, rather than a reform. In fact, the plan’s early details were crafted by the Bush administration and outlined in the 2007 Head Start re-authorization. The outcry from the Head Start community then, Haskins says, was far greater than it is now. The current absence of criticism also results from the fact that Head Start doesn’t have a big national teachers union. While other proposed education reforms have been loudly challenged by the National Education Association, Head Start staff are often part of smaller, non-teacher unions. National Head Start Association Director Yasmina Vinci, who lobbies for Head Start, but not its staff, supports the reform wholeheartedly—perhaps in part because the competition will not reduce overall funding. Even if old providers lose their grants, new ones must guarantee to serve the same number of children in the same geographic area. But the “re-competition” plan has definite flaws that risk being overlooked. For one, it places as much emphasis on minor bureaucratic matters as it does on academics and student health. This is how the Mazique program got into trouble. In March 2011, federal inspectors found that Mazique employees had not properly verified that students were poor enough to qualify for Head Start. Though there was no evidence that any students were ineligible, Mazique was deemed “deficient” and will almost certainly close if it loses out in the re-competition. (Eighty percent of Mazique’s funding, as is the case with most providers, comes from the federal government.) Barnett says this sort of emphasis on bureaucratic compliance detracts from Head Start’s academic priorities. The Head Start paperwork burden is already “ten times worse than public schools’,” he told me; Barnett suggested that the Obama administration, wary of attacks on the program’s supposed profligacy, has put an undue emphasis on bookkeeping. The plan is also insensitive to the fact that several different Head Start programs often operate within a single network. D.C.’s other Head Start provider facing re-competition, UPO, is much bigger than Mazique, encompassing eleven Head Start programs. UPO’s infractions were more serious than Mazique’s—a student in one program was allowed to walk down a hallway unaccompanied, and staff criminal background checks were not performed in another. (No ex-convicts were employed, thankfully.) But if it loses re-competition, 125 staffers, most of whom work in entirely independent programs that had nothing to do with the deficiencies, will lose their jobs. New York City’s and Los Angeles’s citywide Head Start providers, the two largest in the country, are also being forced to compete. They face a problem similar to UPO’s, but on a much bigger scale. New York’s network, for example, has thousands of staff and about 20,000 children at 250 centers—all of whom could be displaced for mistakes that are not necessarily systemic. 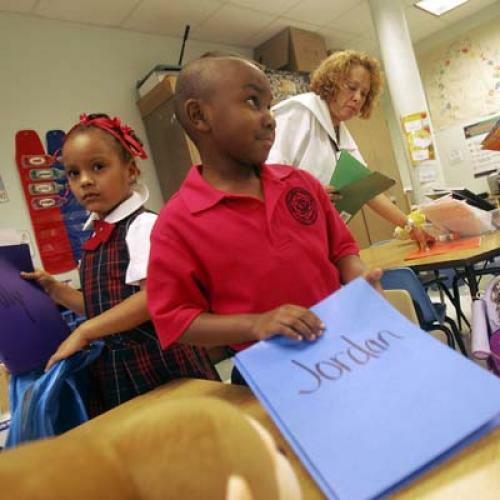 There are serious reasons to reform Head Start. In 2010, the Department of Health and Human Services released a damning study that found Head Start imparted no lasting academic benefit to its graduates—something deemed the “fade-out” effect. Ostensibly, this reform aims to minimize the fade-out effect by weeding out the worst providers, and bringing new, innovative ones aboard. But if minor problems unrelated to Head Start’s mission cripple deserving providers, the plan will have failed. Mazique’s Executive Director Almeta Keys, who began our interview with assurances that she supported healthy competition, ended it on a trepidatious note. In the lobby, she showed me a framed photo of Pelosi and the Mazique student signing the 2007 bill that eventually led to the re-competition. “It’s like we signed our own death sentence,” she told me, attempting a smile.